Suppose you could detoxify your body, purify your skin, increase energy, lose weight, while strengthening your immune system to fight off everything from the common cold, asthma and bronchitis to serious life threatening illness such as cancer. What if all you had to do to receive such benefits was to sit and relax for 15 to 30 minutes a day, three or four times a week? You can do this now with a recently developed form of indoor heliotherapy or light therapy called the FIR sauna. The electromagnetic spectrum segment range between 5.6 - 1000 microns is called Far Infrared. Even on a cold day, the sun feels warm on the skin. This warmth you feel is FIR radiating waves. FIR is a completely safe form of natural light energy. It is not UV, which can burn and damage your skin. FIR waves vibrate at the same frequency as all organic matter. These rays are a sympathetic energy to organic matter. FIR waves, in the 8-14 micron range, are emitted from our palms. These emissions play a role in the "laying on of hands" healing techniques, The FIR segment of sunlight is absolutely essential for all living things, including human beings. The Prime Infralite sauna duplicates these healthy FIR frequencies. Bodily tissues absorb these rays as the water in the cell reacts in a process called "resonant absorption". Resonant absorption occurs when the frequency of the far infrared matches the frequency of the water in the cells of our body. Ordinary saunas heat the air to heat the body by sheer force, most of which bounces of the skin. Prime Far Infrared saunas use the beneficial radiant penetrating energy of natural light to heat the deepest organs and tissues to soften, dissolve and remove deposits of deadly crystallized toxins and acid wastes. We live in a polluted world. There is a direct correlation between external pollution and the internal pollution of the human body. External toxicity of food, air and water always cause internal toxicity of blood, tissues and cellular fluids. These toxic conditions become the breeding grounds for disease and degeneration. Toxemia is the root cause of all disease. The only real way to cure any chronic disease or degenerative condition is to eliminate the root cause by ridding the body of toxins that pollute the blood and tissues, attract germs and weaken resistance and immunity. The skin is our largest organ. Typical sweat produced under normal conditions contains 97% water and 3% toxins. Sweat produced from an Far Infrared sauna is found to be 80-85% water and 15-20% toxins! These toxins contain metals (such as mercury, lead, cadmium, nickel, copper, sodium, aluminium), pesticide residues, petroleum-based toxins, chloride, fluoride, as well as fat. FIR heat causes these toxins to be released from cells. The toxic molecules will then reside transiently in the lymph fluid. Since sweat is manufactured from the lymph fluid, toxins present in the lymph fluid will exit the body through the sweat. The liver and kidneys are not required for this. The air in the Prime Infralite sauna does not get hot. Sweating often begins before the person feels very hot or uncomfortable. For a more effective detoxification: a) increase the oxygen in your blood by regular deep breathing b) Alkalise your body by strictly limiting acid-forming foods and drinks (refined sugar/starch, soft drinks) and increasing alkaline forming foods like fresh fruit and vegetables and juices). Drink plenty of water; ideally ionized, alkaline microwater. As this water has small clusterrs, it will hydrate your body quickly and effectivly, and aid the detox process. Sang Whang in his book "Reverse Aging", says that our bodies require Oxygen in two forms, as O2 from that air and as OH- ions from alkaline water. You can burn 600 or more calories in a single 30 minute session. This passive exercise effect was researched by NASA and Far-InfraRed was determined to be an ideal way to maintain astronauts' cardiovascular fitness during long space flights. Also, fat becomes water-soluble at a 100 F° and can dissolve and enter the bloodstream to be removed from the body by sweat. Sweat therapy using saunas has been extensively researched and shown to be effective at lowering fat soluble chemicals. 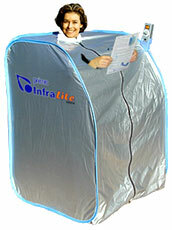 While you relax in your Prime Infralite sauna, your body is hard at work. A 20-30 minute session creates approximately the same amount of perspiration as a six-mile run. Your heart works harder to boost circulation, thus improving your cardiovascular system. Increased circulation has been shown to relieve acne, eczema, psoriasis, burns, lesions, and cuts. Wounds heal faster, which reduces scarring. Blood vessels dilate to help heal muscles and soft tissue while delivering oxygen-rich blood to oxygen-depleted muscles. This also helps soothe muscles after a strenuous work out. Lactic acid is removed. Prime Infralite sauna is deeply relaxting and energising which alone has a profound effect on your health. Stress, pessimism, and negative emotions have been shown to be very destructive to health and longevity. You should also purify your thoughts and detoxify your emotions to really benefit from any physical cleansing therapes. You should augment this natural relaxing and energising effect of the Prime Infralite sauna with deep regular breathing, Yoga, Tai Chi, Chi Gung and Meditation. These therapies will move the energies along the meridian systems, rebalancing you at the energetic levels. Relaxing shiatsu or deep tissue massage with aromatherapy oils would help the detox process tremendously. For that sought after healthy glow, Prime Infralite sauna heat therapy allows increased blood circulation to carry great amounts of nutrients to the skin, thus promoting healthy tone and texture. Skin is left soft and smooth with improved tone and elasticity, the profuse sweating deeply cleanses the pores. An artificial fever is created in the Prime Infralite sauna that aids our immune system. The famous Greek physician, Parmenides, stated: "Give me the power to create fever and I shall cure any disease". This has been validated by scientific research. Different types of white blood cells (T cells, Natural Killer cells, B cells etc) are enhanced by the artificial fever. The Prime Infralite sauna has been very beneficial in treating Fibromyalgia and Chronic Fatigue Syndrome. Our Prime Infralite sauna is manufactured in Taiwan to the highest standards. Our research found this to be the best available. The unit is easy to assemble and can be folded.